This term paper topic is global warming and vulnerable effects on Bangladesh. In our term paper we have tried to discuss all the critical issues related to global warming. Our main focus is on causers, effects of global warming, proper solution and vulnerable effects on Bangladesh by which we can be conscious about devastating effects of global warming we have tried our level facts to add essential picture and some important document. ‘Global warming’ is the most talked of topics in the recent times. Now, it has become the most dangerous problem for the whole world. We live on earth and our earth is covered with Ozone layer. There is a definite range of temperature for the world. When the temperature goes above that rouge, then the world loses its ecological balance. World temperatures are increasing day by day. It is known as ‘Global warming’. So, ‘Global warming’ refers to the increasing temperature in the atmosphere. The temperature of the atmosphere is increasing continuously. There are many reasons behind this increasing. According to the belief of the climatologic, Green house effect is the prime cause of this problem. Green house effect means the gradual warming of the air surrounding the earth as a result of heat being trapped by environmentally pollution. This is exemplified by the destruction and burning down of tropical rain forests, by traffic that clogs up city Streets, by the rapid growth of Industry, the use of Chlorofluorocarbons (CFC) in packaging and manufacturing Commercial products, the use of detergents such as washing powder and washing up liquid and so on Global warming. Air warming is the increase in the average measured temperature of the Earth’s near-surface air and oceans since the mid twentieth century, and its projected continuation. The Earth’s climate changes in response to external forcing, including variations in its orbit around the Sun (orbital forcing) changes in solar luminosity, volcanic eruptions and atmospheric greenhouse gas concentrations. The detailed causes of the recent warming remain an active field of research, but the scientific consensus is that the increase in atmospheric greenhouse gases due to human activity caused most of the warming observed since the start of the industrial era. This attribution is clearest for the most recent 50 years, for which the most detailed data are available. The effects of forcing agents on the climate are complicated by various feedback processes. water to evaporate into the atmosphere. Since water vapor itself acts as a greenhouse gas, the atmosphere warms further; this warming causes more water vapor to evaporate (a positive feedback), and so on until other processes stop the feedback loop. The result is a much larger greenhouse effect than that due to 002 alone. Although this feedback process causes an increase in the absolute moisture content of the air, the relative humidity stays nearly constant or even decreases slightly because the air is warmer. This feedback effect can only be reversed slowly as 002 has a long average atmospheric lifetime. Earths atmosphere acts like a green house, warming our planet in much the some way that an ordinary Green house worms the air inside its lass walls. Like glass, the gases in the atmosphere let in light yet prevent wheat from escaping. this natural warming of the planet is called the green house effect. Green house gases carbon dioxide, Methane, Nitrous oxide, and CFC- are transparent to certain wavelengths of the sun’s radiant energy, allowing them to penetrate deep into the atmosphere or all the way to earth’s surface. Some of these energy is desorbed by the earth’s surface, and some of the energy is then released back dotards the space, As infrared radiation. The green blouse gases and clouds affectively prevent some of the infrared radiation from escaping, thus warms the earth’s atmosphere. The recourse effect was by Joseph Fourier in 1824 and was first investigated quantitatively by Santa Arsenics in 1896. It is the process by which absorption and emission of infrared radiation by atmospheric gases warm a planet’s lower atmosphere and surface. EXISTENCE of the greenhouse effect as such is not disputed. Naturally occurring greenhouse gases have a mean warming effect of about 33 00 (59 °F), without which Earth would be uninhabitabIe.~511261 On Earth, the major greenhouse gases are water vapor, which causes about 36—70% of the greenhouse effect (not including clouds); carbon dioxide (C02), which causes 9—26%; methane (CH4), which causes 4—9%; and ozone, which causes 3— 7% [2281 The issue is how the strength of the greenhouse effect changes when human activity increases the atmospheric concentrations of some greenhouse gases. three-quarters of the increase in 002 from human activity over the past 20 years. Most of the rest is due to land-use change, in particular deforestation. The present atmospheric concentration of CO2 is about 385 parts per million (ppm) by volume. Future CO2 levels are expected to rise due to ongoing burning of fossil fuels and land-use change. The rate of rise will depend on uncertain economic, sociological, technological, and natural developments, but may be ultimately limited by the availability of fossil fuels. The IPCC Special Report on Emissions Scenarios gives a wide range of future CO2 scenarios, ranging from 541 to 970 ppm by the year 2100. Fossil fuel reserves are sufficient to reach this level and continue emissions past 2100, if coal, tar sands or methane catharses are extensively used. Global temperatures on both land and sea have increased by 0.75 °C (1.35 °F) relative to the period I 860—I 900, according to the instrumental temperature record. This measured temperature increase is not significantly affected by the urban heat island effect. Since 1979, land temperatures have increased about twice as fast as ocean temperatures (0.25 °C per decade against 0.13 °C per decade). Temperatures in the lower troposphere have increased between 0.12 and 0.22 °C (0.22 and 0.4 °F) per decade since 1979, according to satellite temperature measurements. Temperature is believed to have been relatively stable over the one or two thousand years before 1850, with possibly regional fluctuations such as the Medieval Warm Period or the Little Ice Age. Seat temperatures increase more slowly than those on land both because of the larger effective heat capacity of the oceans and because the ocean can lose heat by evaporation more readily than the land. Scientists have studied global warming with computer models of the climate. These models are based on physical principles of fluid dynamics, radioactive transfer, and other processes, with simplifications being necessary because of limitations in computer power and the complexity of the climate system. All modern climate models include an atmospheric model that is coupled to an ocean model and models for ice cover on land and sea. Some models also include treatments of chemical and biological processes. These models predict that the effect of adding greenhouse gases is to produce a warmer climate) However, even when the same assumptions of future greenhouse gas levels are used, there still remains a considerable range of climate sensitivity. Including uncertainties in future greenhouse gas concentrations and climate modeling, the IPCC auljptes a ‘warming of 1.1 °C to 6.4 °C (2.0°F to 11.5 °F) by the end of the 21st century, relative to 1980—1 999. In May 2008, it was predicted that “global, surface temperature may not increase over the next decade, as natural climate variations in the North Atlantic and tropical Pacific temporarily offset the projected anthropogenic warming”, based on the inclusion of ocean temperature observations. The representation of clouds is one of the main sources of uncertainty in present-generation models, though progress is being made on this problem. A recent study by David Douglass, John Christy, Benjamin Pearson and Fred Singer comparing the composite output of 22 leading global climate models with actual climate data finds that the models do not accurately predict observed changes to the temperature profile in the tropical troposphere. The authors note that their conclusions contrast strongly with those of recent publications based on essentially the same data. Although it is difficult to connect specific weather events to global warming, an increase in global temperatures ixia in turn cause broader changes, including glacial retreat, Arctic shrinkage, and worldwide sea level rise. Changes in the amount and pattern of precipitation may result in flooding and drought. There may also be changes in the frequency and intensity of extreme weather events. Other effects may include changes in agricultural yields, addition of new trade routes, reduced summer streamfiows, species extinctions, and increases in the range of disease vectors. Some effects on both the natural environment and human life are, at least in part, already being attributed to global warming. A 2001 report by the IPCC suggests that glacier retreat, ice shelf disruption such as that of the Larsen Ice Shelf, sea level rise, changes in rainfall patterns, and increased intensity and frequency of extreme weather events, are being attributed in part to global warming.1791 While changes are expected for overall patterns, intensity, and frequencies, it is difficult to attribute specific events to global warming. Other expected effects include water scarcity in some regions and increased precipitation in others, changes in mountain snow pack, and adverse health effects from warmer temperatures. Per capita greenhouse gas emissions in 2000, including land-use change. Per country greenhouse gas emissions in 2000, including land-use change. Since the last decades of the 20th century, increased awareness of the scientific findings surrounding global warming has resulted in political and economic debate Poor regions, particularly Africa, appear at greatest risk from the projected effects of global warming, while their emissions have been small compared to the developed world. At the same time, developing country exemptions from provisions of the Kyoto Protocol have been criticized by the United States and Australia, and used as part of a rationale for continued non-ratification by the U.S.1l°71 In the Western world, the idea of human influence on climate has gained wider public acceptance in Europe than in the United States. The issue of climate change has sparked debate weighing the benefits of limiting industrial emissions of greenhouse gases against the costs that such changes would entail. There has been discussion in several countries about the cost and benefits of adopting alternative energy sources in order to reduce carbon emissions 101 Organizations and companies such as the Competitive Enterprise Institute and Exxon Mobil have emphasized more conserves change scenarios while highlighting the potential economic cost of stricter Related climatic issues. Avariety of issues are often raised in relation to global warming. One is ocean acidification: Increased atmospheric CO2 increases the amount of CO2 dissolved in the oceans. CO2 dissolved in the ocean reacts with water to form carbonic acid, resulting in acidification. Ocean surface pH is estimated to have decreased from 8.25 near the beginning of the industrial era to 8.14 by 2004,E1221 and is projected to decrease by a further (114 to 0.5 units by 2100 as the ocean absorbs more CO2. Since organisms and ecosystems are adapted to a narrow range of pH, this raises extinction concerns, directly driven by increased atmospheric CO2. that could disrupt food webs and impact human societies that depend on marine ecosystem services. Global dimming, the gradual reduction in the amount of global direct irradiance at the Earth’s surface, may have partially mitigated global warming in the late 20th century. From 1960 to 1990 human-caused aerosols likely precipitated this effect. Scientists have stated with 66—90% confidence that the effects of human-caused aerosols, along with volcanic activity, have offset some of the global warming, and that greenhouse gases would have resulted in more warming than observed if not for these dimming agents. Ozone depletion, the steady decline in the total amount of ozone in Earth’s stratosphere, is frequently cited in relation to global warming. Although there are areas of linkage, the relationship between the two is not strong. Sea level rise in some tidal stations in the Bangladesh coast are: Hiron Point: 4 mm per year: Char Change: 6 mm per year and Cox’s Bazar: 7: 7.8 mm peryar, as reported by the Sarc Meteorological Center in Dhaka. Regional variability of the rates of rise is due mostly to non-uniform changes in temperature and salinity, and is related to changes in ocean circulation. 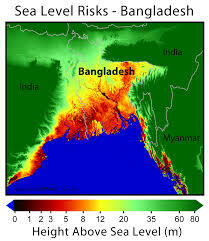 Bangladesh is a flat deltaic country where 80% of the land is less than 12 metered above sea level. Because of the geographical setting and physical characteristics, the country is regularly inundated by reverie and coastal flooding. Climate change will make the country highly vulnerable to sea level rise, intense cyclones and storm surge flooding. Remaining scientific uncertainties include the amount of warming expected in the future, and how warming and acted changes will vary from region to region around the globe. Most national governments have the Kyoto Protocol aimed at reducing greenhouse gas emissions, but there is ongoing political and public debate worldwide regarding what, if any, action should be taken to reduce or reverse future warming or to adapt to, its expected consequences.